Don't worry Mac and Linux gamers: Though the public beta of Quake Live that opened its doors yesterday only supports Windows, id Software's John Carmack tells Joystiq that "it's pretty high on my priority list to have the Mac and Linux support." To that end, an external contractor is working on just that "right now" but Carmack acknowledges that Quake Live compatibility "is going to be a much bigger factor in [the Mac and Linux markets] for people wanting to play the game than it is on the Win32 market where you have so many more options." Carmack was even hopeful that, with enough popularity and some special attention from Apple, the could get "maybe a handful of milliseconds better [on Mac OS] than you can actually get on Windows." So, that's operating systems, but what about browsers? Sure, most of us are using Internet Explorer or Firefox but what about Google's Chrome? Quake Live producer Marty Stratton tells us that, while "it officially doesn't support Chrome" it "does actually work ... with some glitchiness." We didn't ask about that other WebKit-based browser, Apple's Safari, but Stratton said that while Mac and Linux support are the priorities, "I suspect we will get Chrome supported as well." Promising news for Mac gamers, to be sure, and with many id insiders using Macs - Quake Live's own Marty Stratton said, "Right now I have to switch over to Boot Camp to play it in Windows" and John Carmack famously debuted the id Tech 5 engine at an Apple keynote - we're inclined to believe it's the high priority they say it is. Check back later today for our full interview with id's John Carmack and Marty Stratton. 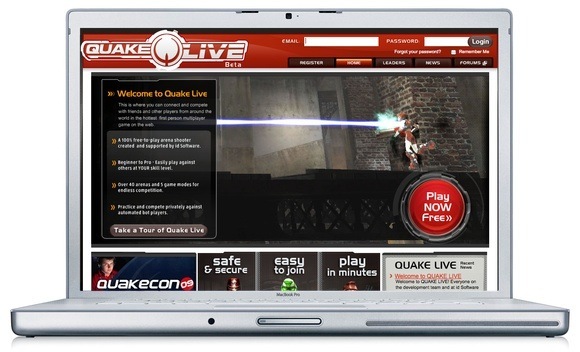 Carmack: Quake Live on Mac, Linux 'high on my priority list' originally appeared on Joystiq on Wed, 25 Feb 2009 10:06:00 EST. Please see our terms for use of feeds.